You’ve probably heard about NoSQL, and you may wonder what it is. NoSQL represents a fundamental change in the way people think about storing and accessing data, especially now that most of the information generated is unstructured or semi-structured data — something for which existing database systems such as Oracle, MySQL, SQLServer, and Postgres aren’t well suited. NoSQL means a release from the constraints imposed on database management systems by the relational database model. 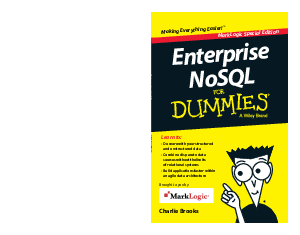 This free eBook, Enterprise NoSQL for Dummies, MarkLogic Special Edition, provides an overview of NoSQL. You’ll start to understand what it is, what it isn’t, when you should consider using a NoSQL database instead of a relational database management system and when you may want to use both. In addition, this book introduces enterprise NoSQL and shows how it differs from other NoSQL systems, as well as explains when NoSQL may not be the right solution for your data storage problem. You’ll also learn the NoSQL lingo, which customers are already using NoSQL and why, and tips to find the right NoSQL database for you.